Marin County is a a picturesque area across the Golden Gate Bridge from San Francisco of quaint walkable towns, with homes perched on rolling hills and a low rise, unspoiled feel. People typically move to Marin to escape the more urbanized South and East Bay and San Francisco. Eighty-three percent of Marin cannot be built on as the land is agricultural and protected open space. This is not stopping ABAG, developers, social equity, housing and transit advocates from pushing for high density housing near transit in Marin. Plans for high density housing have sprung up the length of the county - multiple Marin communities found themselves declared Plan Bay Area "Priority Development Areas" (PDAs) making them targets for intense high density development. These designations occurred with little or no consultation by the elected officials that had volunteered them, and without any clear understanding of obligations to develop or impact. Residents finally came together and said they'd had enough after an unsightly 5 story, 180 unit apartment complex appeared adjacent to an existing freeway choke-point - the city that allowed it had little choice due to onerous ABAG housing quotas that if unmet left the town open to litigation by housing advocates with crippling legal bills and penalties. The last straw was the publication of a station area plan to generate transit ridership that suggested 920 more high density units be built in nearby Larkspur - another freeway bottleneck. This video, put together by Citizen Marin, a coalition of neighborhood groups seeking to restore local control, was put together to drive awareness of this accelerated urbanization. 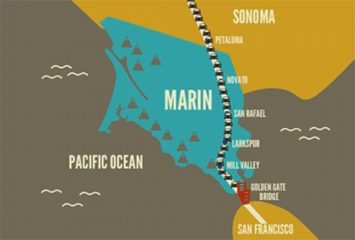 For Marinites the video serves as a wake up call - most moved to Marin to live in a more rural / suburban location. Marin offers some of California's most walkable and attractive downtowns already: Sausalito, Mill Valley and San Rafael. All offer the kind of small town charm that are a model for others to emulate and attract visitors and residents. The video was written and produced by Citizen Marin's Richard Hall. The video's narrator is from San Rafael - not San Rafael in Marin County but San Rafael, Argentina, and the animation was put together by a team from Kathmandu Nepal. Submitted by Richard Hall on Tue, 01/28/2014 - 23:21. Once again it seems like a shame you switch so quickly to name calling instead of continuing a fact based conversation. Once again the case for TOD has not been made. Sure, a case has been made to some politicians who find it a convenient excuse to serve their campaign donors, to government agencies whose power base grows based on such an agenda - but it has not been made to the majority. Yes it is a complex issue - and you, ABAG and Plan Bay Area (1,000+ page documents) might be accused of gish galluping far better than anyone else. And most of all you need to respect the views of communities, before imposing what you may happen to think is best for everyone. What is needed is public education on this complex topic, not railroading. Throwing terms like "gish galluping" into the mix from your glass house isn't helpful. A constructive debate without name calling is needed. Just one of the reasons I instigated the excellent debate last year in Marin where the two leaders of ABAG and MTC were truly defeated - failing to justify Plan Bay Area's TOD approach. [Stands back awaiting new ad hominem attack; while genuinely hoping to achieve a discussion of the facts. Perhaps there is a civil reader on the TOD side, one that doesn't name call who can privately message me. I am genuinely open minded and interested in getting to the bottom of this complex issue]. Submitted by msetty on Tue, 02/11/2014 - 15:19. And spare me the throw away lamentation about being "civil"...Mr. Hall, if you sleep with dogs like the Agenda 21 conspiracy buffs, the Teabaggers et al, you get fleas.